A CD costs € 5. You can order a CD by email or phone +31 (0) 30-2942625. Shipping costs are € 2,50. The CD with quiet renaissance music on the piano is recorded at our home. 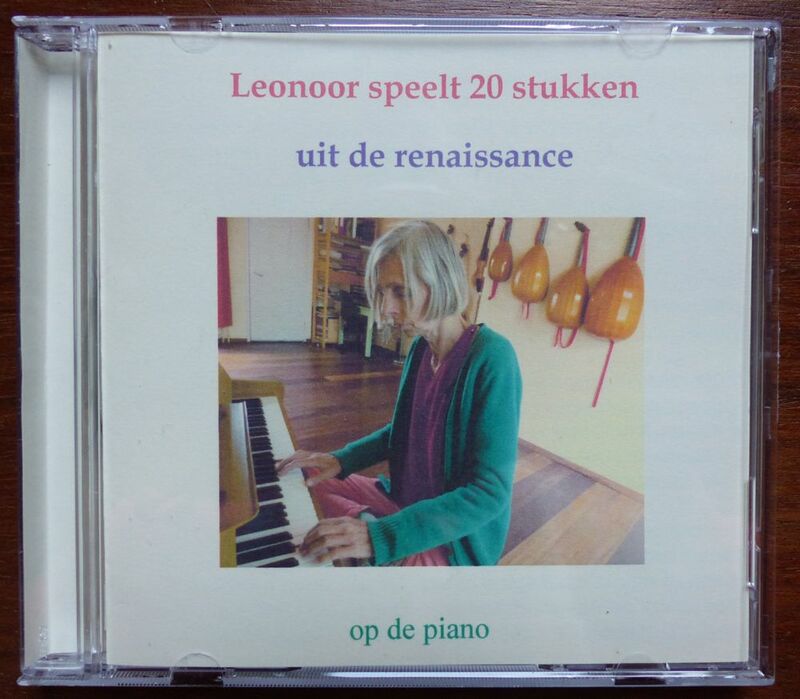 Leonoor plays 20 pieces from the renaissance (1400-1600) on the piano. Leonoor has had 40 years of experience with music. It's not easy to find classical music which is simple and which sounds beautiful. Leonoor is playing the piano with her eyes closed to be able to feel and to hear well what she's doing. She finds it important to play with rest and concentration, so that it's also nice for somebody else to listen, even when you practise. People who would like to play the piano but don't know which music they can play, can start now. 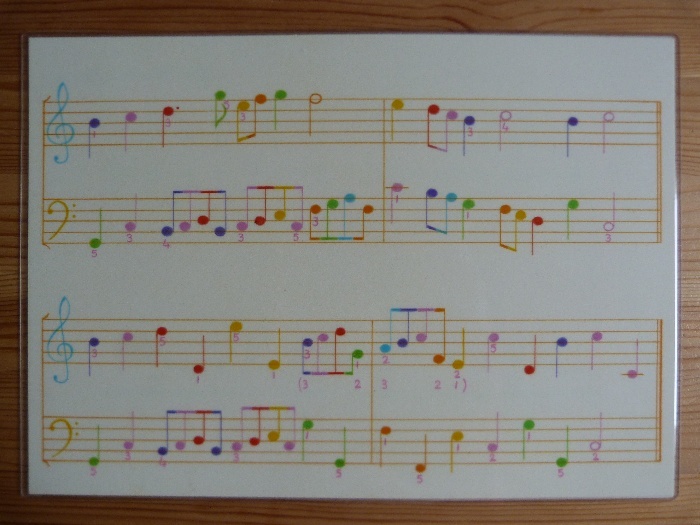 The music with coloured notes is drawn with a pencil. In one piece every same note has the same colour. In another piece there are other colours again, so that you don't learn to read colours, but remain reading notes. The music looks, as opposed to the common black notes, very colourful and also appeals to children very much. Leonoor added fingerings. Fingerings are essential to be able to come to rest and concentration, to get the music also in your motorial memory of your fingers and body. 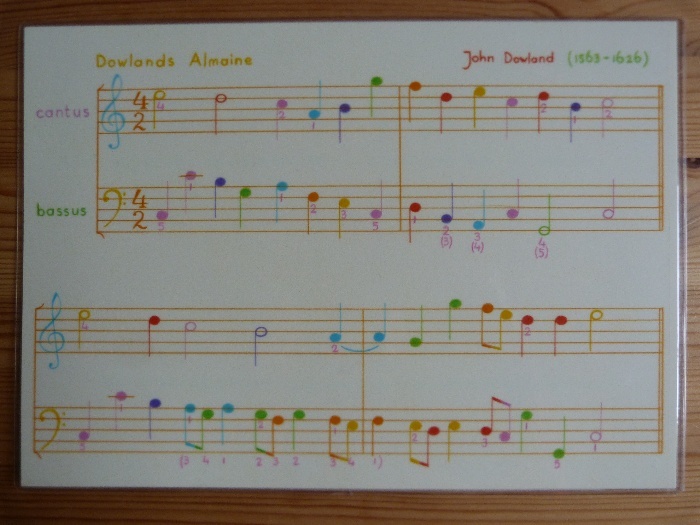 If you want to order the sheet music which is drawn with coloured pencil (with or without fingerings), the best you can do is call us +31 (0) 30 2942625. This music from the renaissance is originally written for harpsichord, virginal or renaissance harp, predecessors of the piano. You can also play this music on two melody instruments. Then you play the right hand of the piano or harpsichord on a high sounding instrument and the left hand you play on a low sounding instrument, for example a violin and a violincello, or a treble recorder and a bass recorder. - stringed instruments like the viola da gamba, viol, violincello. We made our first CD by ourselves in 2009. It was recorded at the home of acquaintances of ours, in their house, a former carriage house. Almost all of the music on this CD was composed around 1600, at the end of the Renaissance. Giovanni Domenico Rognoni wrote 17 four-part canzonas (instrumental songs). 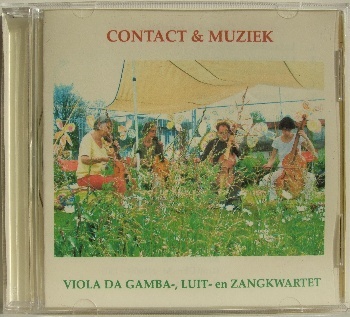 On this CD we recorded five of these canzonas with our viola da gamba quartet or consort of viols. This music, which is virtually unknown, is a hidden gem. In his time, John Dowland was a famous composer from England. He wrote music for lute and singing voice. We also played two pieces by John Dowland, which were originally composed for one and two lutes, on four lutes. We also play a very special piece by Jacob Obrecht on four lutes, based on a theme that served as an inspiration for many other composers at this time. Leonoor also recorded four pieces by John Dowland for lute solo. The final pieces are a song by John Dowland and one by Henry VIII, King of England.